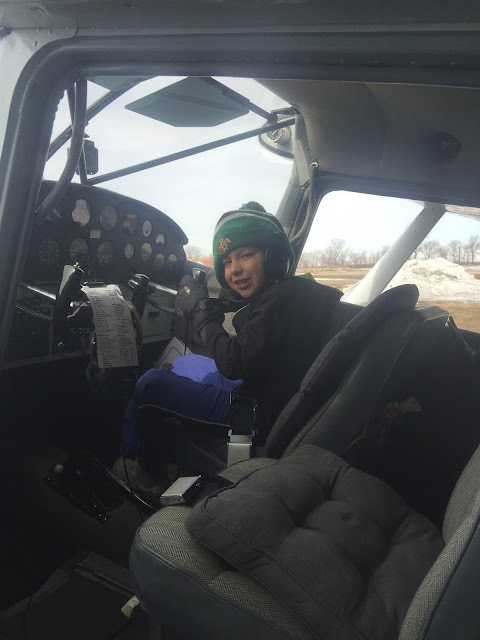 Hayden Mercil, 8, at the controls of the Cessna 180 his dad, Rick Mercil, piloted during a recent day trip for a burger to Sunset Lodge on Oak Island of Lake of the Woods. LAKE OF THE WOODS, Minn. — Eight years ago in January, my life changed forever when Rosa and I adopted our son, Hayden. Our adult girls had left the nest, and this little guy came into our lives out of our desire to provide him a home. Fast forward eight years, and I not only have a son, but I have a co-pilot, too. This was never more evident than on Monday, Jan. 16. Hayden and I both had the day of for the Martin Luther King Day holiday. We decided to take advantage of the beautiful bluebird day to fly my 1957 Cessna 180 from Crookston up to the Northwest Angle of Lake of the Woods for a burger at Sunset Lodge on Oak Island. During the flight, Hayden got 50 cents if he pointed out any towers along the route and $1 if he spotted an airport. We made funny noises in the microphone through the headsets and told silly jokes to each other, just the two of us. It was a perfect father-son day. You can imagine the fun we had! The flight to the Angle took about an hour, and we landed on the ice road near Oak Island. We taxied up to Sunset Lodge and went in and had the best hamburger this side of U.S. Highway 2. Before we left, Hayden had the biggest bowl of ice cream he had ever seen. When we departed, the moan of the old Continental engine tired the little guy out. He put his head on my lap and fell right to sleep. It was only when I radioed the Crookston airport to announce my flight intentions that he awakened. The day ended perfectly, and I couldn't have been happier. It was one of the best flying experiences I ever had—and I've had a few. CENTENNIAL, Colo. — A small plane landed on its belly at the Centennial Airport Sunday morning after the landing gear didn’t come down. There was one person on board the single-engine Cessna Cardinal, airport officials said on Twitter. No one was hurt in the “gear-up landing,” officials said. There was no word on why the landing gear didn’t come down. South Metro Fire Rescue was responding to the airport. Runway 10/28 was closed while they worked to remove the aircraft, officials said. ENGINE: Rotax 912S, s/n: 4429381. The engine was reportedly run without oil and is completely disassembled. PROPELLER: Ivoprop ground-adjustable three blade. Garmin was reported stolen and is NOT included with the salvage. DESCRIPTION OF ACCIDENT: Winds from Hurricane Matthew on 10/07/16 pulled N9888D off the tie-down and pushed it into a fence. The leading edge of the left wing appears to be dented. The right aileron skin is damaged. On March 12, 2017, about 1537 eastern daylight time, a Piper PA-28-140, N8447R, impacted the water during a forced landing shortly after takeoff from Peter O Knight Airport (TPF), Tampa, Florida. The private pilot was not injured. Visual meteorological conditions prevailed and no flight plan was filed for the flight to Sabastian Municipal Airport (X26), Sabastian, Florida. The personal flight was conducted the provisions of 14 Code of Federal Regulations Part 91. According to the pilot, he rented the airplane two days prior to the accident flight, to fly from X26 to TPF for several days. The flight on March 10 was uneventful. On March 12, he arrived at the airport around 1230 and started his preflight inspection of the airplane. The pilot stated he "sumped" the tanks and the fuel was clear of debris. The rest of the preflight inspection was normal and no anomalies were noted. The engine run-up and magneto checks were normal, and he started his take off roll on runway 22. At 60 knots airspeed, he rotated and started to climb. Upon reaching about 100 feet above ground level, he noticed a loss of engine power and the rpm started to drop. He verified fuel and oil pressure were good and started looking for a place to land. 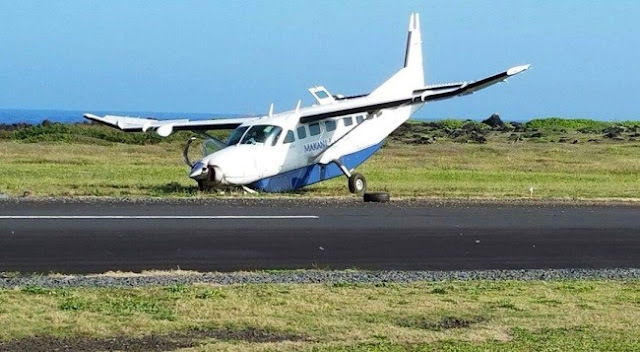 He further stated he could not abort the take-off and land safely on the runway, so he decided to try to turn back to the airport and land on the cross runway. During the turn, he realized he would not make it back to the airport and decided to ditch the airplane into the surrounding water. Once he ditched the airplane, he exited through the cockpit door and a local boater picked him up and took him to shore. Examination of the wreckage by a Federal Aviation Administration inspector revealed that the left wing separated from the airplane. The windshield was fractured in several areas and the right wing leading edge was damaged. The airframe and engine were retained for further investigation. 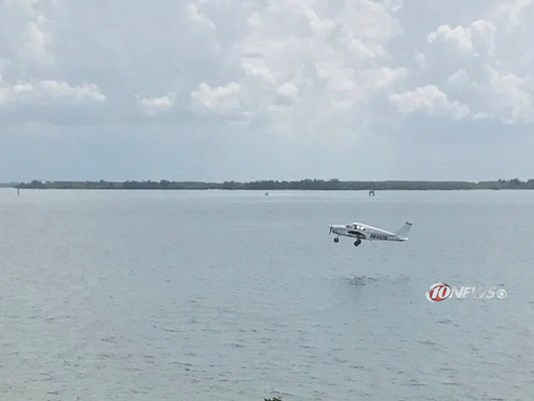 TAMPA -- First responders were on the scene of a downed Piper PA-28-140 Cherokee in the waters off Peter O. Knight airport on Davis Islands in Tampa. According to Hillsborough County Sheriff's Office, only one person was aboard the Piper PA-28-140 Cherokee at the time of the crash around 1:37 p.m. The pilot was pulled from the water from nearby boaters and is reportedly uninjured, according to Tampa Police Department. HCSO said that the Piper PA-28-140 Cherokee experienced a loss of power after takeoff and landed in the water. TPD Marine units will assist in pulling the plane out of Tampa Bay. 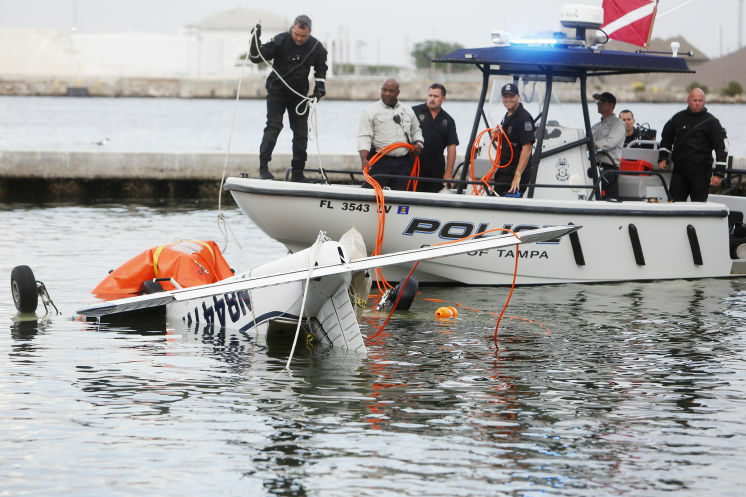 The dive team for the Tampa Police Department was able to finally pull the Piper PA-28-140 Cherokee from the shipping channel several hours following the crash. The Piper PA-28-140 Cherokee will be kept at the Peter O' Knight Airport for further investigation into the cause of the crash. TAMPA — Those spending their Sunday afternoon at the Davis Island Yacht Club knew the small plane was in trouble the moment they spotted it. The Piper PA-28-140 Cherokee was less than 200 feet in the air when it started circling back to Peter O. Knight Airport just moments after takeoff, its engine already sputtering. "It sounded terrible," said Robert Woithe, 14. The plane didn't make it back, however. Seconds later Woithe saw it hit the water tail first, falling just short of the runway. "It looked like it was going to snap in half," Woithe said. It was worse than it looked, however. 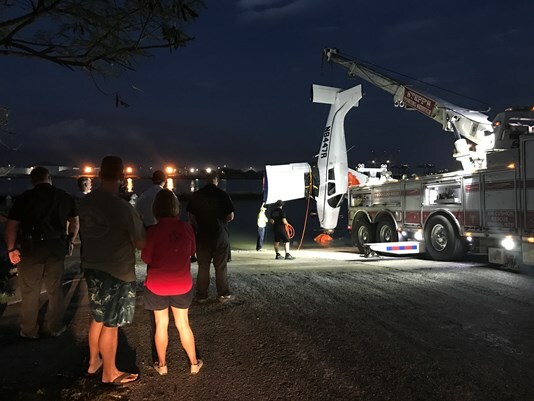 Tampa police said the pilot was the plane's lone occupant and managed to escape injury — and the plane, before it sank into the waters off Davis Islands. The incident took place about 1:37 p.m. The pilot was not identified. Tampa police said the plane lost power shortly after takeoff and couldn't make it back to the airport in time. Witnesses said the pilot opened the cockpit in time to swim away from the plane before it sank into the water. A motorboat rushed over to pick the pilot out of the water. A second boat, captained by Michael Zonnenberg, arrived and started tossing buoys into the water around the sinking plane so officials could find it later. Zonnenberg, 24, of St. Petersburg is a sailing coach at the yacht club and was teaching kids at the moment of the crash. He does not know who was in the boat that rescued the pilot. Woithe, who participated in the yacht club's Fireball and Friends Regatta earlier in the day, said he and other club members rushed to the water with life preservers just in case. "I'm glad they weren't needed," he said. Tampa police divers were sent to the scene to recover the plane. The plane flipped over under water and came to rest on its roof. The divers placed large balloons beneath the wings and inflated them, bringing the plane — wheels first — to the surface. Then they used the balloons and two boats to maneuver the plane to a nearby boat slip. Police called in a heavy duty tow truck to lift the plane out of the water. The plane will be transported and stored at the airport pending an investigation. The National Transportation Safety Board will investigate the incident, police said. The pilot, who was also the owner of the of amateur-built gyroplane, stated that he adjusted the prerotator motor pressure plate before the flight by moving it closer to the clutch to improve rpm. During takeoff, the gyroplane rolled right, and he was unable to maintain control. The gyroplane subsequently impacted the ground and cartwheeled, which resulted in substantial damage to the rotor, mast, and cabin. The pilot further stated that, due to his adjustment, it was likely that the prerotator did not disengage, which resulted in increased right torque and the inability to control the gyroplane during takeoff. The pilot’s improper adjustment of the prerotator motor, which resulted in its failure to disengage and the subsequent loss of aircraft control during takeoff. The pilot, who was also the owner of the of amateur-built gyroplane stated he adjusted the prerotator motor pressure plate prior to the flight by moving it closer to the clutch to improve rpm. During takeoff, the gyroplane rolled right and he was unable to maintain control. The gyroplane subsequently impacted the ground and cartwheeled, which resulted in substantial damage to the rotor, mast, and cabin. He further stated that due to his adjustment, it was likely that the prerotator did not disengage, resulting in increased right torque and the inability to control the gyroplane during takeoff. 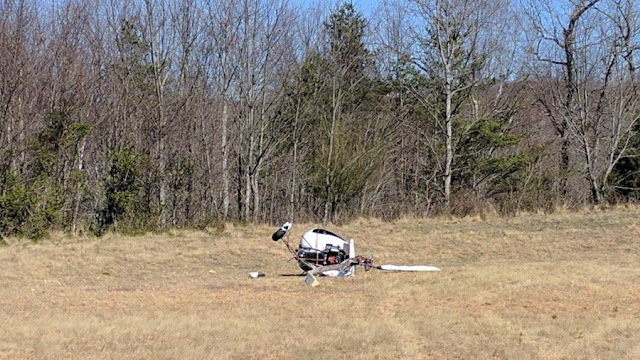 Surry County — Just before 2 p.m. Sunday, officials say, a call came in about a gyroplane crashing at Mt. Airy Airport. The crash happened about 30 yards off the runway. The pilot was the only person on board and he was taken to Baptist Hospital. Officials are not releasing his name yet, but do know that he is 65 years old. Airport officials are on the scene right now and have reported the incident to the Federal Aviation Administration. MOUNT AIRY, N.C. - A gyroplane crashed at Mt. Airy Airport Sunday afternoon, according to the Surry County EMS director. John Shelton, Director of Surry County EMS, says the gyroplane crashed while the pilot attempted to land. He crashed about 30 yards off of the runway. 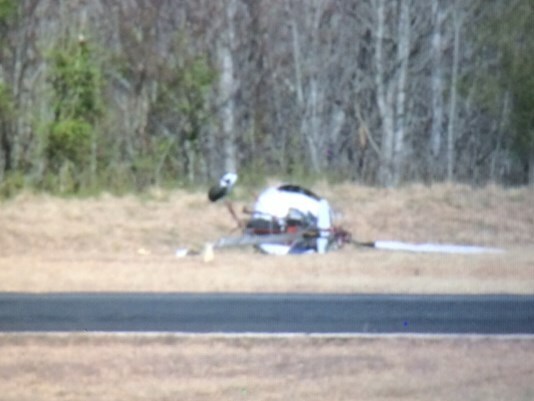 According to an airport employee who witnessed the crash, the pilot climbed out of the gyroplane. Shelton says he was taken to the hospital for evaluation. GULFPORT, MS (WLOX) - Authorities in Harrison County responded to a plane in distress at Gulfport-Biloxi International Airport Sunday morning. The call came in shortly after 9:30 a.m., saying that Delta flight #2312 had a "loss of flight control." 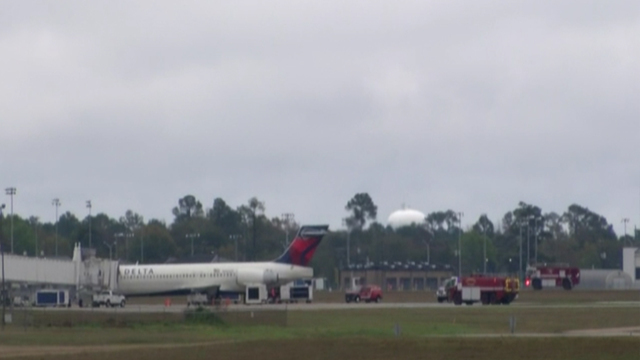 Emergency responders from Harrison County and Gulfport, as well as the Gulfport Combat Readiness Training Center, responded to assist the airport's emergency crews, arriving at the airport shortly before the plane landed. The plane was able to land safely without anyone being injured. Officials say 98 people were on board the plane. According to Delta's website, the plane is a Boeing 717-200. It was originally scheduled to proceed to Atlanta from Gulfport but is now delayed a little over three hours. A representative from Delta Airlines says when a flight has an emergency maintenance issue while in the air, they are able to call for a priority landing to ensure they get on the ground quickly and safely. In this incident, she said the plane calling for a priority landing was more precautionary than anything. The Boeing 717 will receive maintenance and any necessary repairs before leaving Gulfport to go on to Atlanta. "Pilots are always doing everything they can to make sure every flight is safe," said the Delta representative. "But, in situations like this, it's really a priority landing, not anything massively wrong. It sounds a lot scarier than it is." No additional emergency precautions were deemed necessary while in the air, added the representative. Authorities in Harrison County responded Sunday morning to a plane in distress at Gulfport-Biloxi International Airport, according to ABC News. The call came in shortly after 9:30 a.m., saying that Delta Flight 2312 had a "loss of flight control." The plane landed successfully without any injuries to the 98 people on board. A representative from Delta Airlines said when a flight has an emergency maintenance issue while in the air, they are able to call for a priority landing to ensure they get on the ground quickly and safely. In this incident, she said, the call for a priority landing was more precautionary than anything. The Boeing 717 will receive maintenance and any necessary repairs before leaving Gulfport to go on to Atlanta. Injuries: 2 Minor, 7 Uninjured. The pilot of the commuter airplane reported that she was going to establish an approach and landing on runway 05 at an airport with a single runway and no taxiways. While on a 7-mile final, she communicated with the pilot of an airplane that was on short final for the same airport. The pilot that was on short final reported that he would report when he was clear of the runway, and he did. The commuter pilot acknowledged the other pilot’s clear-of-runway transmission and initiated the approach. As the pilot descended through 150 ft above ground level, she noticed that the airplane that she had communicated with was not clear of the runway. The airplane on the ground was near the runway 23 numbers with the propeller turning facing toward her landing airplane. She aborted the landing, but the airplane did not climb. The airplane impacted the runway hard and bounced. She reported that, when the airplane touched down after the bounce, she “applied left rudder pedal to steer the aircraft off the runway and out of the way of the other aircraft’s possible flight path.” The airplane exited the left side of the runway and ground-looped to the left. The airplane sustained substantial damage to the right side of the fuselage and the right wing. After the groundloop, the pilot of the airplane near the runway 23 numbers attempted to take off. He was contacted via radio transmission by the airport manager and told that the runway was closed until further notice. Examination of the accident airplane by Federal Aviation Administration Aviation Safety Inspectors determined that there were no preimpact mechanical anomalies with the airplane that would have prevented normal operation. The pilot’s loss of directional control during the aborted landing, which she conducted due to another airplane, whose pilot had reported being clear of the runway, still being on the runway, and resulted in a hard landing and ground loop. The pilot of the commuter airplane reported that she was going to establish an approach and landing to runway 05 at an airport with a single runway and no taxiways. While on a seven-mile final, she communicated with the pilot of an airplane that was on short final for the same airport. The pilot that was on short final reported that he would report when he was clear of the runway, and he did. The commuter pilot acknowledged the other pilot's clear of runway transmission, and initiated the approach. As the pilot descended through 150 feet above ground level, she noticed that the airplane that she had communicated with was not clear of the runway. The airplane on the ground was near the runway 23 numbers with the propeller turning, facing toward her landing airplane. She aborted the landing but the airplane did not climb. The airplane impacted the runway hard and bounced. She reported that when the airplane touched down after the bounce, she "applied left rudder pedal to steer the aircraft off the runway and out of the way of the other aircraft's possible flight path." The airplane exited the left side of the runway and ground-looped to the left. The airplane sustained substantial damage to the right side of the fuselage and the right wing. After the ground-loop, the pilot of the airplane near the runway 23 numbers attempted to takeoff. He was contacted via radio transmission by the airport manager and vehemently told that the runway was closed until further notice. Examination of the accident airplane by Federal Aviation Administration, Aviation Safety Inspectors, determined that there were no preimpact mechanical anomalies that would have prevented normal flight operation. Registered Owner: Schuman Aviation Co Ltd. Operator: Schuman Aviation Co Ltd. This is preliminary information, subject to change, and may contain errors. Any errors in this report will be corrected when the final report has been completed. NTSB investigators used data provided by various sources and may have traveled in support of this investigation to prepare this aircraft incident report. On Friday, February 26, 2016 at 1548 Hawaii standard time (HST), a runway incursion occurred at Daniel K. Inouye International Airport, Honolulu, Hawaii, when a Cessna 208B, registration N865MA, over flew a Cessna 172, registration N269ME in line up and wait on runway 22L at the taxiway P intersection. The C208B was operating under the provisions of Title 14 Code of Federal Regulations (CFR) Part 135 and the C172 was operating under the provisions of 14 CFR Part 91. Visual meteorological conditions prevailed and there were no injuries to passengers or crew of either aircraft. Upon landing, aircraft appeared to brake hard. Ground looped. Veered off runway. Landing gear collapsed. Flight KDS800, aircraft on landing, gear collapsed. 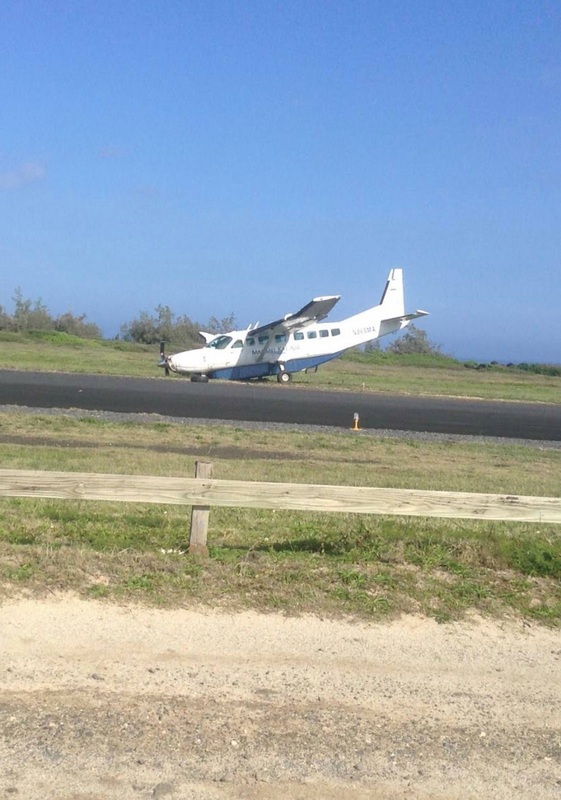 Federal investigators are looking into what caused a close call for a plane at Kalaupapa Airport on Molokai. The Makani Kai Air Cessna 208B Grand Caravan was arriving from Oahu around 8:30 Saturday morning. The pilot, traveling with 9 passengers, called in about seven miles out after seeing another aircraft doing practice maneuvers. “She announced her intention, ‘I’m going to land at Kalaupapa, are you clear of the runway’, and the other aircraft said yes, we are clear of the runway.” Said Richard Schuman, President of Makani Kai Air. Schuman said it turned out the other plane, carrying a student pilot and flight instructor, wasn't actually clear. After maneuvering to avoid crashing into the other plane, Schuman said the pilot was forced to make the hard landing. One witness, Keahi Hanakahi, was waiting for a friend on that flight. He prepared for the worst after seeing the plane 'bounce a couple of times and then spin'. “I saw the whole plane turn sideways, and I thought a gust of wind had taken it. I thought ‘Oh no, here we go. It’s going to be an accident.” Said Hanakahi. He said the situation could have been much worse. “They were a lot better off than you’d think. The pilot was traumatized because she took responsibility for what happened, but it wasn’t her fault. Actually, she saved lives.” Said Hanakahi. After the close call, Schuman said the other plane tried to take off. The student pilot and flight instructor stopped after running out of runway. They then ran from the scene. “In this case we don't know what their intentions are because they’ve run away and to my knowledge nobody has talked to them yet.” Said Schuman. All 9 passengers walked away safely from the incident. KALAUPAPA, MOLOKAI (HAWAIINEWSNOW) - Federal investigators are looking into what caused a mishap for a small plane on Molokai. The president of Makani Kai Air said another pilot's mistake led to the hard landing for his company's Cessna 208B Grand Caravan on Saturday. The nine passengers and the pilot all escaped without any injuries. The president of Makani Kai Air, Richard Schuman, said the flight from Oahu to Kalaupapa was on final approach around 8:30 a.m on Saturday. The pilot had received the all clear from another aircraft that was on the runway, according to him. "So she said, 'You are clear of the runway?' and the other aircraft said, 'Yes.' Then she started to touch down and she noticed the airplane was on the runway coming towards her," Schuman said. There is no air traffic controller at Kalaupapa's tiny airport so the pilots communicate with each other. Schuman said when his pilot made a last-minute maneuver to avoid the other aircraft, the wing of the Cessna 208 Caravan may have hit the runway. According to the Federal Aviation Administration, the plane had its gear collapse after a hard landing and then went off the runway. "There was an aircraft on the runway that wasn't supposed to be there. My airplane was trying to avoid it. Now we know what happened, we don't know why they were there. When you get a hold of those guys you'll find out," Schuman said. According to Schuman, the instructor and student pilot on the other plane walked away after unsuccessfully trying to take off. "After the accident, that plane came up to the site, turned around, tried to take off, the runway was too short so he stopped. The state workers are on the radio telling him you can't take off you almost caused an accident," he said. FAA officials said they've heard that another plane was at the end of the runway, but it is undetermined at this time if it had an impact. Schuman said the plane is unable to fly due to damage to its wing, propeller and nose. The Federal Aviation Administration reports that a plane made a hard landing at the Kalaupapa Airport on Molokai Saturday morning. A Makani Kai Air flight from Honolulu was arriving when, at around 8:30 a.m., the front landing gear on the Cessna 208B Grand Caravan collapsed due to the hard impact of the landing. The plane then went off the runway. Nine people were on board, including a hospital patient, and no critical injuries were reported. The state Dept. of Transportation reports that the plane was removed around 3 p.m. The FAA did tell us that there was another plane on the runway at the time of the Makani Kai Air hard landing — a Cessna 172 — but couldn’t confirm if it was in any way involved. “I seen the plane on the runway, the wheels were damaged,” said Shannon Kalani Aliiloa Crivello. “The park rangers were there already, escorting people off of the plane. Because of the small size of the runway, no flights were able to leave or land in Kalaupapa. Its length is under 3,000 feet. 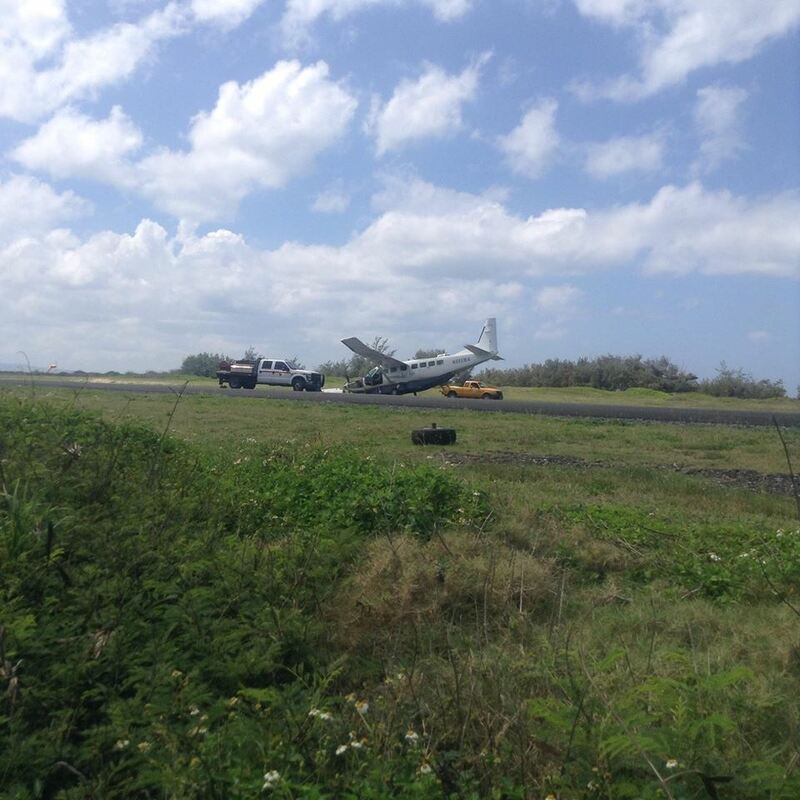 As for the other Cessna that was in the area, a witness who wished to remain anonymous told us that that plane landed on the runway shortly before the Makani Kai aircraft hit the runway and lost control. Hanzawa says when it comes to the runway at Kalaupapa, it’s up to the pilots to communicate when they are landing. Story and video: http://khon2.com The National Transportation Safety Board traveled to the scene of this incident.